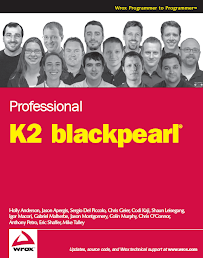 A few weeks ago K2 sent out an early version of their training VPC for BlackPeal. The training VPCs for K2.net 2003 were invaluable for building early iterations of K2.net processes, building up demos and proof of concepts, etc. These notes are not comprehensive and will require some more research on my part as I get more acclimated with all the new features and functionality. The following are notes that I gathered while go through the initial set of the materials. SmartObjects is the new big thing they have released and it pretty impressive. SmartObjects provide a way to access business data from your line of business databases. With K2.net 2003 you had to build up your own service layers and then integrate them into the processes. Now BlackPearl provides the services layer to integrate business data across the enterprise. There are two types of SmartObject. From my initial research the first are SmartObjects which the developer defines where the data is stored in the SmartBox sever. You can now very rapidly create data structures to persist your workflow data to. The second are SmartObjects which you can code up using their SDK which can load up from any disparate datasource available given you have a service of some type to work with. The data is not cached within SmartBox server, you are just building a proxy based on a start interface to retrieve data and surface it up through K2. This deserves a deeper dive and some best practices will develop with time. BlackPearl has tried to make the creation of line rules easier with the addition of Actions. When building events you define actions that an end-user can select from. When the wizard is done BlackPearl will generate all of the lines which can be used to connect to other activities. This assumes is that conditional logic is somewhat simple; which is not always the case. In many cases K2 will create a dropdown for users to select these actions making your development of processes very quick. So if I had a process where a manager should be able to select approve, deny, or resubmit I would create those three actions and within InfoPath a dropdown will be added by K2 where those three values would appear (do not worry, it is not hard coded into the InfoPath form). These actions are also available everywhere throughout K2.net workspace, SharePoint web parts, etc. as context menu items allowing the user to take quick action on an event instance without having to open a form. There was a neat new event called Forms Generation Event which is a client event handler to create very basic forms within the new K2.net workspace. Although, given how simple it was, I still need to test the boundaries of it to see how feasible it is to use with real heavy duty business requirements are thrown at it. Nothing replaces writing a start custom ASP.net page. BlackPearl now provides a reporting solution which was not available in K2.net 2003. This was a major problem with K2 2003 and the solution was to persist all of your data externally to support reporting. Still K2.net is not the best place to store your business data and I still say it is best to keep that data externally (the new SmartObjects help with this best practice). Regardless all of the reporting within BlackPearl is now based completely on Reporting Services. They now provide several wizards to generate your own reports with the K2 Workspace. What was really exciting is that you can write your own custom reports in Reporting Services and then host them within the K2.net workspace. Reports associated to workflow may not always be K2.net centric and there may be multiple datasrouces where you need to retrieve data. Plus they have written their own data provider to access their data so you have immediate access to all data within K2 to create sophisticated reporting using Reporting Services. This is a huge improvement. Users can now sign up for Notifications for processes, events, activities, destination rules, line rules, start rules, succeeding rules and escalations. This is great because with K2.net 2003 I continually had to design around not make K2 a spam machine. Now end-users are empowered with the ability to subscribe to events. BlackPearl provides a web enabled process design tool that is embedded within SharePoint. The tool is better than the SharePoint Designer for creating standard business workflows as you can build workflows with InfoPath forms, they are re-usable, and easier to create custom activities. Still this tool is scoped toward created workflows within SharePoint only as it only is meant for designing workflows for a list or a library. I still need to test the boundaries for this tool. Given how easy it is to create workflows in Visual Studio using K2, I am more inclined to work with it at the moment. BlackPearl now provides a way to create processes with Visio. To be honest when I heard about this at first was excited but skeptical it would be provide a way to create good workflows. During my initial testing of it turned out to work well and I was pleased with it. I will still need to again test the boundaries of this. The great thing about using Visio is that when defining the business process with business users during the elaboration phase I always use Visio to define the process. Although there is not always a one-to-one with the activities and events that I want to expose the business user to. So now if I create the workflows using Visio I can mark them up and them move them over to Visual Studio. The integration with InfoPath 2007 has improved. Things to be excited about is the ability to support web enabled InfoPath forms, have multiple InfoPath forms in a single process, the InfoPath forms are integrated with Visual Studio along with your K2 process and the deployment of the InfoPath form with the K2 process (you no longer have to publish your InfoPath form, K2 will publish it for you). Although when adding .Net managed code to your InfoPath form has some problems due to the new MOSS requirement that any form with .Net manage code must be deployed through central administration. I will be doing a deeper dive into this soon. K2.net provided a ton of integration with WSS 3.0 and MOSS. There are administrative event handlers for provisioning new sites, managing user permissions and groups and lists. These are very important as too often I go to companies where their SharePoint implementations have grown out of control because of no governance. Sometimes if the governance is too tight this can become a barrier for usage as business users cannot get what they need in a timely basis. These event handlers can be used to define light-weight business processes to automate the management of an enterprise MOSS implementation. For lists and document libraries in SharePoint MOSS provides event handlers to do almost all of the operations you could need. Create, update, delete, check in/out, manage permission, move, copy, update metadata, download/upload documents, etc. K2.net provides search event handlers that allow the developer to build up criteria to find items in SharePoint and then take action on them. I did not use reflector to go underneath the hood to see what it is being done but looks like these events are basically creating CAML queries that can go out and find items. K2.net provides some new Records Management event handlers (create and delete records as well as put a hold on a record). My initial research into MOSS Records Management a few months ago I found that there is no workflow around the actual movement of documents into the records center. We have to rely on business users to go out, find a document and then move it to the records center. In many situations it is not that simple as there will be some sort of approval process before the document should be moved over. BlackPearl can be leveraged to build that business process. BlackPearl provides several event handlers around managing web content. As you may know CMS has been rolled into MOSS. In MOSS this means new content management templates, publishing pages, etc. BlackPearl provides event handlers that can create, copy, move, delete, check in/out for publishing pages. As well you can get and update publishing page content, create pages using Conveters and create and Update reusable Content. I can see how this can be used extensively to create workflow around the management content. BlackPearl provides integration with the BDC to expose SmartObject data. As you may know it can become difficult to create the XML configuration for the BDC to read data. If you are already loading in line of business data into your SmartObjects it is really almost no effort to expose any SmartObject through the BDC into SharePoint. It was really simple to hook up a SmartObject into the BDC as K2 has created some custom screens within SharePoint Central Administration to facilitate this. So if you have some SmartObjects with some Oracle, SAP and SQL data all you need to use the K2's BDC integration and you are done. Within Visual Studio they have introduced what they call environment configurations. They are similar to K2 2003 StringTable but are reusable between processes. Improved presentation and integration with Visual Studio. Their implementation of WPF for their wizards is really clean and is exciting to see a real implementation of. They also implemented this neat little thing where the developer can draw letters on the Visual Studio canvas which will create a new activity. Is it necessary; not really; but it is neat. The BizTalk events were not present on the VPC. I found out they have not be released yet. This is not terrible as it is still possible to invoke BizTalk through other means but I have used the K2 BizTalk adapters on two projects. Getting into the properties of an event or activity is much easier now. Workflows can be initiated directly from the workspace. In the past, we would have to write little stubs to kick off workflow. The K2 Service Manager is now part of the K2 workspace. The K2 workspace is still geared towards the power user as it can still expose too much information to the common everyday business user. They have created a new concept called "Roles" which seem to be similar to the Destination Queues which were available in K2.net 2003. Since K2[blackpearl] will be supporting k2.net 2003 event templates some of those event templates weren't re-created. All the k2.net 2003 templates including web services, sql, etc should work with K2[blackpearl] once the backward compatibility support is released. Yeah, I saw that K2 was still in the process of creating more event templates. My post is not talking about migration but according to K2 all event built in 2003 will work in BlackPearl. My comment was more in regards to the SQL Event Handler as a whole. I know it empowers business users to create queries to the database but if you need to build anything that should scalable I would never use that event handler and recommend not using it. It basically embeds the SQL right into your C# code.